For whatever reason our American taste buds aren't really huge fans of anise the way just about every other culture is. The Turkish go nuts for Raki while the Greek drink their Ouzo. Sambuca is seen more on the table and less in the club in Italy and in Southern France, Pastis and water is a great way to drink through an afternoon of playing Pétanque and smoking cigarettes. I am sure someone's grandmother you know used to make anisette cookies and their grandfather loved chomping down on black licorice. Then something happened and we lost that love of black jellybeans. It has always been a love or hate thing but as of late it seems to be on the outs. I should mention Absinthe and its legal battles in history here. It is very much so a spirit and not a liqueur and was banned in many countries for containing Thujone which has psychedelic properties...also in France grapes were finally making a comeback after the Phylloxera epidemic and well...absinthe stood in the way of that. It was far easier to make it look bad to get people back to drinking Cognac. Anyways, enough of anything is a bad thing and when drinking absinthe that can be bottled over the 70% alcohol mark even a little can push you over the edge. You would be dead from alcohol poisoning before the Thujone made you see fairies and sage and tarragon actually contain measurable amounts of it. I usually stick to pastis. 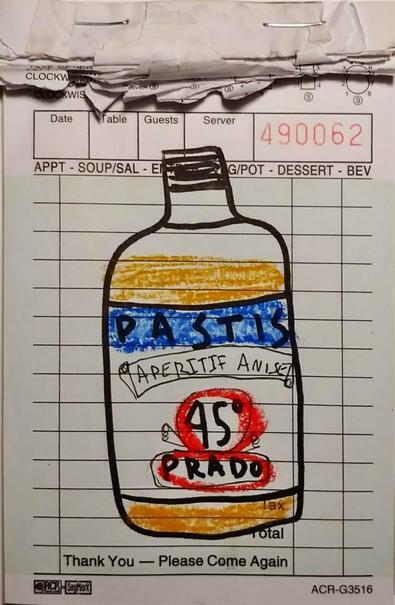 Pastis is an anise flavored liquor that sits between 40%-45% alcohol by volume and you can even find N/A versions like Pacific made by Pernod Ricard (Google it for a great vintage swimsuit commercial). In the south of France it is known as the milk of Marseilles and that is fun to say and even more fun to drink. REGARDLESS of your boules game skills, you have to keep a bottle of either Herbsaint, Prado, or Granier on the shelf in order to make a wide range of drinks because without it...the drinks just do not work. I really enjoy a nice glass of Prado Pastis and water (say 1 part Prado to 5 Parts cool water) on a hot day. It is a beautiful pale green and so refreshing. Getting near the end of the drink? Just top it off with water and like magic you are back to sipping that tongue numbing elixir. The milky color is due to an effect called louching which is all the ingredients that are not water soluble (like anise, fennel, and star anise) being suspended in the drink. It kills the sharpness of the liquid and makes it far more potent to your nose.